In regards to the skulls, they're really easily done, and I hope you won't be disappointed when I share you how easily they're done. So, really easy..Start with the outline, then a triangle for the eybrows (3), fill it, a turned triangle for the nose (5), and some filling to smoothen everything...easy as cake. 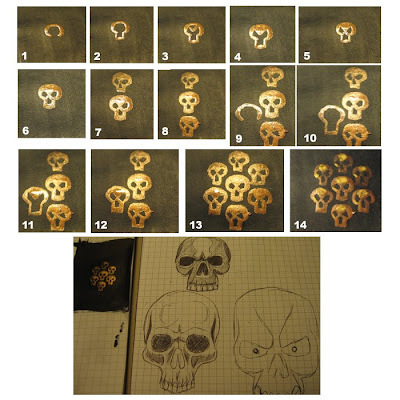 Then do 3 in a line, so you get the feeling for the gaps, and start with the next column (9) and within a heartbeat you have a nice group of skulls (13).Now some highlights with Shining Gold (14) and that's it.